Do you know what it takes to catch a criminal? A fast police car, that’s what! Remember being a kid and playing around with those remote-controlled, battery-operated cop car toysthat light up and sound off a cute little siren? Well, modern police vehicles are a world away from what they used to be. And rightly so, since criminals are getting faster and smarter! Here are some serious toys for boys who love to speed down the highway at the speed of light. These cars seem to have been specifically made for engaging in legendary car chases – truly, they are the stuff that car movies are made of. In fact, it might seriously be worth a career change so as to realize the dream of driving one of these speed sleek machines, on a daily basis. Unveiled at the Essen 2015 Motor show, this car is all about performance and style. 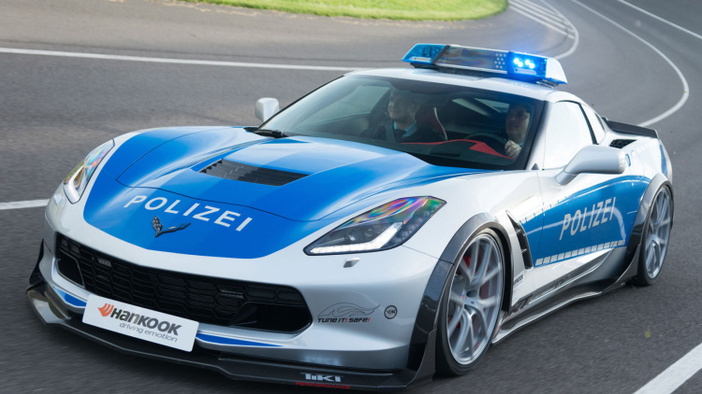 The German Federal Ministry of Transport and the Association of Automobile Tuners built this one-off Corvette for German Police. The car features a sleek carbon fiber body which includes a front lip spoiler, side skirts, extended front and rearwheel fenders as well as a rear spoiler. Kitted with General Motors’ new 6.2-liter V8 engine, this vehicle can clock more than 460hp power and 464 lb-ft of torque. The C7’s seven-speed automatic transmission will allow cops in Germany to go from zero to 62mph in just over 4 seconds, reaching its top speed of 180 Mph.